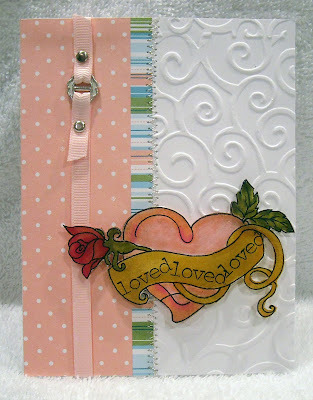 I have another wonderful image from the Worldwide Printable Stamps company to share today. And I have to admit that I went a big embellishment crazy with this one...I just couldn't help myself! Humm...I said to myself...how about some tiny rhinestones in each scallop? Ohh, nice! Now that heart really needs to be covered in glitter. Umhum, lovely. A bit more sewing, since the machine was already out...and what about that pink paper, it needs something...Oh yeah, a few Stampin' Up! rubons! Now just add a tiny sentiment...Perfect! LOL! Ever have one of those nights when you just can't stop adding to your cards? 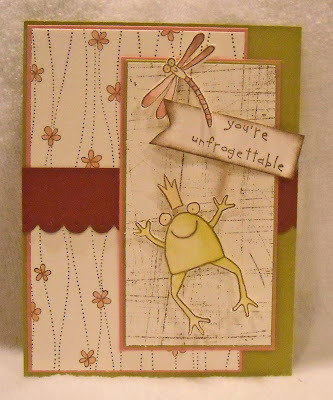 :-) The paper used on this card is from Stampin' Up!, I really adore their double sided papers...such great designs and weight. The two I used here are retired but now that the new Spring/Summer catalog is out, I'm looking forward to playing with some new designs. The digital image was colored with Copics and the tiny rhinestones are from Taylored Expressions. We're expecting another foot of snow here in the Northeast again today and I've got a sick baby at home so we're all snuggled down on the couch watching Walle (love that movie!) and eating Poptarts! OK, its just the kids that are eating Poptarts...but I would eat a box of them if I thought I could get away without gaining 10 pounds! hee hee Enjoy your day!! A few weeks ago I saw a call for design team members on Splitcoast Stampers. Since I typically have plenty of work to do I haven't even considered submitting for any teams recently but this company sounded very interesting so I decided to check out the opportunity. I heard from Worldwide Printable Stamps yesterday, hoping for good news, but unfortunately the owners, for personal reasons, need to step back from their work for awhile. (No news on whether or not I was being considered...I'll just pretend I was! hee hee) Along with the email, they attached a few files containing their amazing digital only images! How cool is that? Stamp images that are only offered in a digital format - I love it! And I love working with their images, they're really unique and easy to work with. For this card, I simply printed out a set of their images, colored my selection with Copics and created a card! 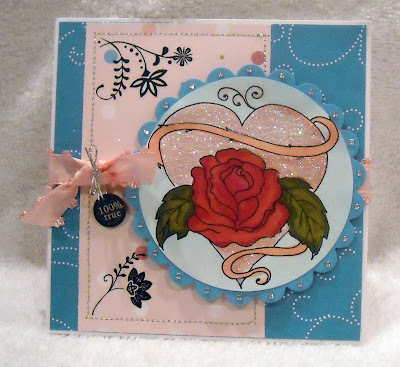 This adorable image above was cut out (the bottom of the heart had some lovely swirls that I cut off...just too detailed to cut around) and attached to my card with dimensional tape. I did stamp the "loved" sentiment on the ribbon. The other elements are from Stampin' Up! And how about that fancy sewing with silver thread! I finally, finally got a new sewing machine (for Christmas) and I'm in my glory! 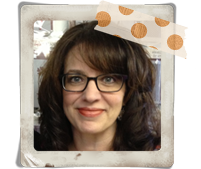 You can visit one of the owner's blogs, Sonia, on her blog. She has wonderful goodies to see and you can purchase any of their existing images on the Worldwide Printable Stamps site. Enjoy! who is rich in mercy, because of His great love with which He loved us, even when we were dead in trespasses, made us alive together with Christ (by grace you have been saved), and raised us up together, and made us sit together in the heavenly places in Christ Jesus, that in ages to come He might show the exceeding riches of His grace in His kindness toward us in Christ Jesus." If it were not for God's mercy, shown to those who are actively engaged in living a life void of obedience to His commands, there would be no hope for any of us. If it were not for God's mercy none of us could stand before Him on judgement day. If it were not for His mercy, we would be hard pressed to survive the trials of each and every day. If it were not for His mercy, we would not have Christ's sacrifice, nor the ability to have the heavy burden of our sins lifted from our shoulders. God's glory, goodness, lovingkindess, and mercy is magnified when the hearts of the sinful are turned toward Him. My favorite part of the scripture referenced above is "but God." But God...that is so powerful. I was dead in my trespasses. I loved my Godless lifestyle, I had no desire to read the Bible, to go to church, or to worry about whether or not I was living up to any one's standards, other than my own shallow idea of what it meant to be "good"...I lived to please myself. "But God" in spite of that lifestyle He chose to show me mercy. Not because of anything I did or who I was but simply because of His great love and mercy. And what a humbling reminder from Paul to show mercy to those around us for although we now trust in Christ, there was a time when we didn't and if it were not for God's mercy, we would remain unchanged. In and of ourselves, there is no difference between those that trust Christ and those who don't for we are certainly no better and, at times, can even behave much worse. The only difference is mercy. The only difference is the light-filled grace of God that has shined into our darkened hearts, transforming our minds and conduct. I would encourage you to take a look at the other beautiful work created by the SALT design team and please join with us by using your God-given talents to submit your own work of art based on this week's theme. Have a blessed week and may the mercy of God continue to shine upon you! another black and cream card? ;-) I know...this is starting to become a bit repetitive...I really do have lots to share but I have yet to find a bit of extra time to take pictures, upload them, etc. So until then I'm afraid you're stuck with my black and cream card selection! I actually have six of these cards and they were part of a selection of cards that were used to promote the Odd Bird Planet stamp line. Johanna challenged the team to make six cards using whatever selection of stamps and paper we'd like, but they all needed to coordinate. I was really happy with how this bunch turned out. And I can thank that delightful Crate paper...boy do I love the monochromatic style of this line! 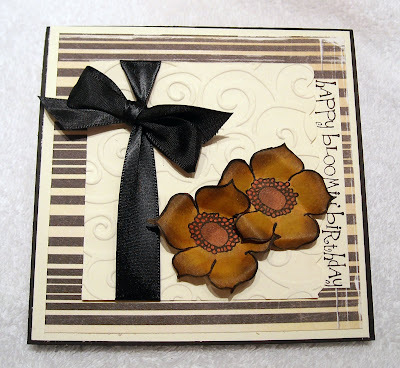 This card has the floral image embossed in black in the background of the card, you can just make it out in the photo, along with a colored (with Copics) flower cut out and mounted on the front. All I used was a strip of the polka dot Crate paper as an accent, along with my sentiment. I doodled around the sentiment frame as I felt like it needed "something" else. And speaking of Odd Bird Planet...don't forget that they having a huge sale from now until January 23!! Be sure to check out all the goodies being offered at 25% off retail price! Promise to be back with something other than black and cream...very shortly...until then, enjoy! 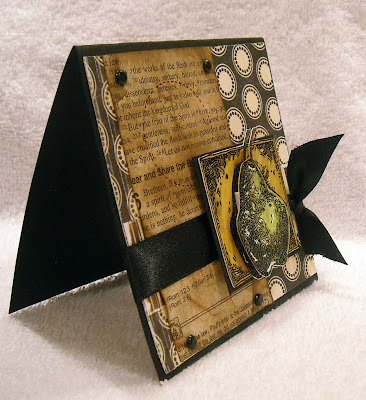 -Top layer of cardstock, with stamping, etc. Basically, you want the magnet to only be covered by one layer of cardstock so that you won't have any difficulty with the two sides sticking together. When you're ready to stop reading, just drape the two square pieces of the bookmark over the page you want to save and the magnets will "click" together, holding your place until you're ready to return to your book. Don't forget to check in on Johanna's blog and the Odd Bird Planet design team blogs (links on the right) for details on the Chinese New Year sale, coming up on 1/16-23!! Enjoy! Johanna has just announced a sale on Odd Bird Planet stamps to celebrate Chinese New Year!! The sale will take place from January 16-23 and a huge selection of stamps will be marked down 25%! Check out all the details and list of what is on sale here! Wow! Have I been slacking on the blog posts or what? My first week back after what seemed like a month long vacation from work and crafting, was as expected - busy! :-) I was so busy that I completely forgot about the SALT post until a team member happened to post a message about it to the group, forgot to place an order for a class I'm teaching this Friday, and failed to post much last week! I need an secretary! LOL! I was also working on a 10-year wedding anniversary present for my hubby that I'll share later this week...just need to get some photos taken. For today...I'll leave you with yet another black and cream creation using my Odd Bird Planet stamps. And speaking of Odd Bird Planet...you're going to want to check in here and on Johanna's blog during this week...we have some exciting news to share soon!! Until then...enjoy your Monday!! 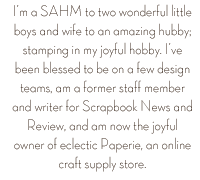 SALT is a faith-based challenge blog comprised of a diverse group of card makers, scrappers and altered art fans from across the world who have been brought together through our love of Jesus Christ and our desire to express our faith in creative ways. 1. Term – At this time we do not have a beginning and end time for the team. The current team has been in place for over a year. The understanding is that you would sign up for as long as you are able to effectively participate in the challenges. You will be free to leave the team at any time. 2. Format – Based on a rotating schedule, design team members will take turns posting a challenge (for example, "hope" or "God is good") to the team via our Yahoo message board. The entire team will then create projects based upon that topic. 3. Design work – You should be able to complete a card, scrapbook page, or altered project once every other week. You will also be required to write a short blurb about your topic and provide supporting scripture text. 4. Blog – Familiarity with Blogger is a plus as you'll need to be able to format and post your work and blurb independently. Our friendships developed through the SALT blog have been a tremendous blessing and we look forward to getting to know you and reviewing your work and application. Please browse through our design team's work on the SALT blog and forward any questions you may have to Kim Schofield at ksdm@comcast. net. I suspect that having children is one of the tools that God uses to point out our shortcomings, especially when you have a child who mirrors your personality flaws. It is beyond humbling to correct your children for the very thing that you tend to do. I am constantly reminded, when struggling with the difficulties of raising two young children, of what Christ offers. Has He not been longsuffering in dealing with my rebellion, self-controlled in allowing me to have more time on this earth and not harshly reprimanding me every time I err, and loving in that He died for me while I was fully emerged in a lifestyle that was contrary to His commands. Those truths are a help when correcting a child who has thrown a toy across a room in frustration for haven't I, in spirit, thrown my own toy across a room when something doesn't go my way. Perhaps even more sinful for me as I'm an adult and know more. My lack of control because things aren't going my way is a shaking of the fist at God for not giving me what I want when I want it. It's a shameful way to react towards the One who created us and sustains us each and every day. In our natural state no one is able to live a Spirit filled life. Self-control will be lacking in many areas; overeating, drinking in access, cursing in God's name, anger...the list goes on. Without Christ, we unable to "fix" all these areas of our lives and, in our own power, begin to live in a loving, joyful way where we're longsuffering towards mankind and controlled in our emotions and behaviors. Once we've trusted in what Christ accomplished on the cross, making a way to be free from our damaging sins, we will continue to struggle with bringing certain behaviors under control. The only difference between these two? The one who is trusting in Christ is heartbroken when we respond in an angry or selfish way to those around us. We have disappointed Christ and grieved the Holy Spirit and we will be quick to repent and apologize to those we've hurt. Whereas the unconverted will feel justified in their reactions, no matter how hurtful, never seeking Christ or others for forgiveness and help. And yet...there is great hope. One needs only to call upon the name of Christ to be free from living a sinful, self absorbed life. Evidence that we love Christ can be seen when we regularly exhibit the fruits of the Spirit...not when we're perfect, for that won't happen here on earth...but when our every day experience begins to more and more mirror Paul's call to the Galatian church, to put to death our sinful passions and desires and to walk in the Spirit. Since I've been on a black and cream kick, I decided to continue that trend with today's card. 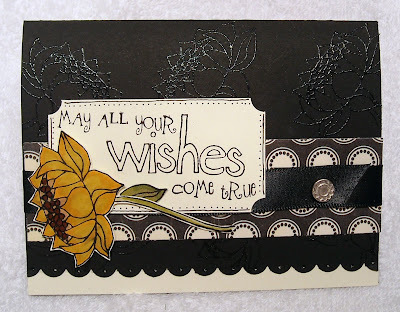 This is a 4x4" card created with a retired Stampin' Up! image, black cardstock, and brads. The polka dot/stripe paper is that fabulous Crate paper, and the ribbon is a random scrap that I had in my stash. The Bible scripture text used on the card was created by photocopying a page in my Bible and then aging the daylights out of it. I've used a red rub on to highlight the "fruit of the Spirit and self control" text. 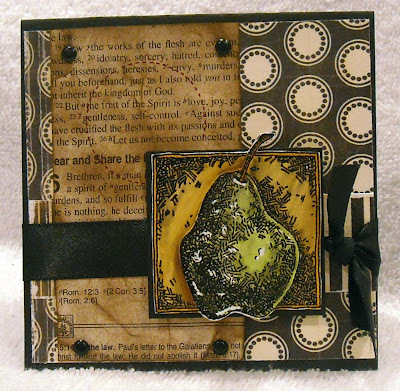 The pear was stamped twice and embossed with black embossing powder before I colored the image with Copics. I then cut out one of the pears and attached it to the first with dimensional tape. I also used my brand new white gel pen to add a few highlights to the pear. Enjoy your day! Another selection from my Crate paper/Odd Bird Planet black and cream card stash. 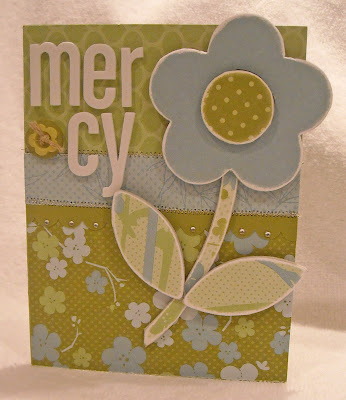 The floral image used, from OBP, also has a stem but I cut it off for this card. The flower has been stamped twice, colored with Copics, cut out and "fiddled with" (that's a technical term) to give the petals some dimension and depth. The cream cardstock has been run through the Cuttlebug for a bit of texture and one side of the cardstock has a scalloped edge. The rest of the card is pretty easy to understand. I'm busy working on a big project this week...will have photos to share shortly!! I'm off to try and finish that up tonight!! Enjoy! We're also taking a holiday break for this week so the next SALT challenge will be posted in two weeks.